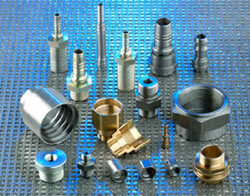 Rodmatic Ltd has been established for over 40 years, specialising in the manufacture of high volume turned components. The company has built up an excellent reputation and developed a range of machine types enabling parts of any volume to be produced competitively out of many types of materials. Accreditation to ISO 9000:2000 was gained in 2002. Rapid response and minimal lead-times are made possible by operating 24-hour shifts. High volume capacity is served by 40 multi-spindle machines with a capability range from 10mm to 82mm diameter. Quick response for high volume parts is our speciality often followed by planned Kanban or agreed call-off demands. The business is controlled with the aid of an integrated computer system. In house toolroom facilities and dedicated transport all help to enable Rodmatic to provide an unrivalled service.